This species of Neo. 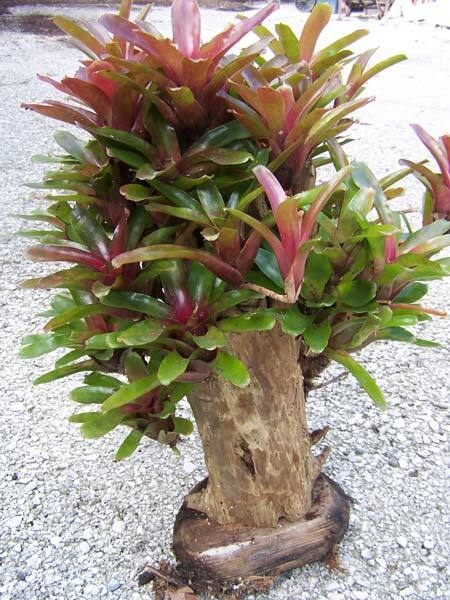 was distributed and in cultivation before it was scientifically described and named, so it is often mistakenly thought to be a hybrid. In this illustration, it has been mounted onto a stump. if they are shaded by those above. 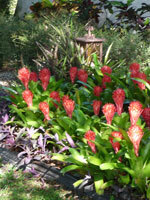 The whole clump can be more green in the Summer when it is watered by natural rainfall, which contains lots of nitrogen. Click the image at right for a larger view. Alcantarea imperalis is perched high on a hill in the jungle. 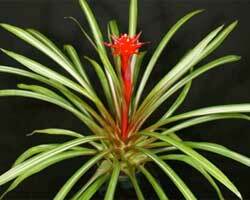 Tillandsia usnoides, commonly called 'Spanish Moss' hangs like a veil across the top of the scene. 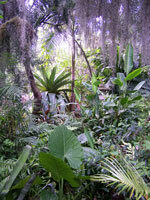 A plethora of other tropical plants also inhabit the area. This jungle is actually in a Tampa garden. Educational Note: Spanish Moss is not from Spain and is not a Moss. I also does not kill the host tree, as a parasite would, as it only attaches to trees, but does not drain nutrients from it's host like Mistletoe. Click the image at left for a larger view. 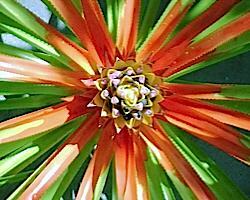 The Billbergia pyramidalis is a bromeliad from Brazil. This grouping in my neighborhood puts on a show year after year! 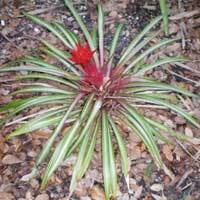 This bromeliad is an old time favorite, requiring little kindness from the gardener, repaying the space it's been given with a spectacular show of late summer flowers. 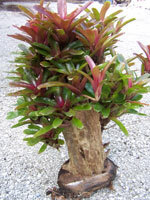 It has been cultivated for about 180 years, a testament to its reliability. with his cell phone camera. it might be ready for release.